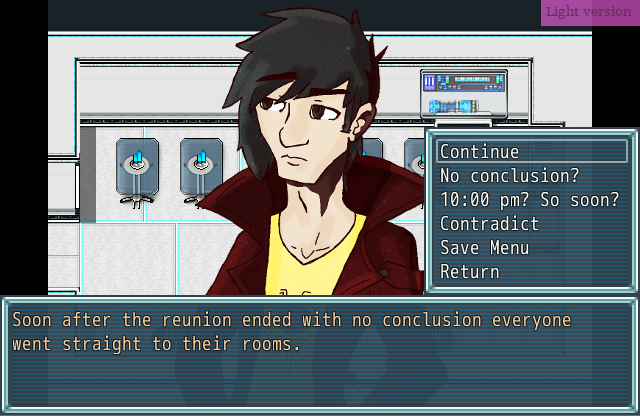 You are tasked to figure out a murder that could’ve been caused by the very first sentient AI. Similar to Phoenix Wright. However as a detective game it does a lot of things where it’s impossible for you to be wrong and it’s just trial and error. The last part with Charles is annoying since I know what to do but the game isn’t giving me options and it just goes on a loop. Has potential but I think as a detective game it's not as good. Heya, I'm here for round G of the Secret Santa. Personally, I found the game's idea interesting but clearly the presentation and gameplay suffered from the contest's time limit. I agree with AubreyTheBard about the tiles and sprites being off-putting, but mostly because I found the bust style to be much higher quality and more interesting in comparison. 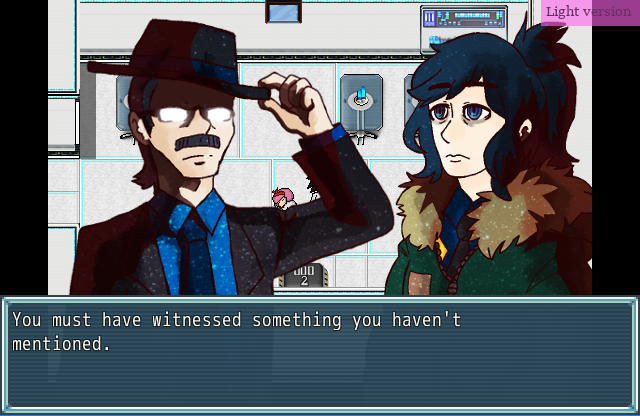 It's possible that going for a full visual novel style with only drawn backdrops and the busts interacting would've made for a more cohesive look. Possibly I've read too many mysteries, but I guessed the killer right away and was a bit disappointed that I was right due to a choice the killer made that showed they clearly wanted to be caught (I don't want to spoil it for new players, so I'll be vague), but overall it was an okay ending. The story's grammar and spelling is one of the worst parts of the game unfortunately because of the numbers of errors. I understand that the creator's native language isn't English, but in a story-driven game it's important that everything is written clearly so the player can understand (it took until close to the end of the game for me to realize that the 'reunion' the characters kept talking about wasn't a party but a meeting, which completely changed how I had been looking at interactions). The story could really use a native English-speaking editor to help fix those issues. The interrogation and investigation modes are a bit rough, but serve their purposes. I didn't find the 'A-F' scoring system to be very useful though, it mostly served to punish the player and since there wasn't a way to raise the score if the player made mistakes early on it could result in game overs repeatedly in the end (unless you do what I did and restart once I knew which options were the right choices). Dropping or adjusting the scoring system could help make the interrogations more fun for the player. I agree with AubryTheBard about the suggestion of implementing an notes system where the clues could be reviewed, since right now it just relies on the player to remember everything (I ran into a similar issue with my own team's game, so I assume it was more of an issue with the time limit than not wanting to have it in the first place). With more work I think this could be a fun little game, but the contest version currently leaves a lot to be desired. Hmm I'm still in a inner debate whether to make full drawn backdrops or update the current tiles, since I also wanted to player to be able to move in the investigation and with full drawn backdrops that option is not possible, but I'll consider making it full visual novel style, and indeed I know my origin doesn't excuse the execution, I may need a native English editor. With the score system I actually never thought about a way to raise your score and I like that idea, I'll implement it in the final version. As for the the killer I guess I've got some writing to improve! Thank you for your review c: ! 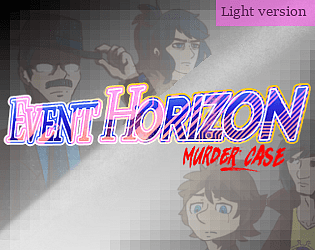 Event Horizon Murder Case is a highly story-driven game. The player does not move around at their own will at all; the only interaction is multiple-choice decisions, although some of those involve a loop of choices until the player figures out the correct answer (and enough blunders will cause a game-over). As has been noted in comments on the main game page, the play style is highly reminiscent of the Ace Attorney series. In terms of production values, Event Horizon Murder Case features original graphics and music. 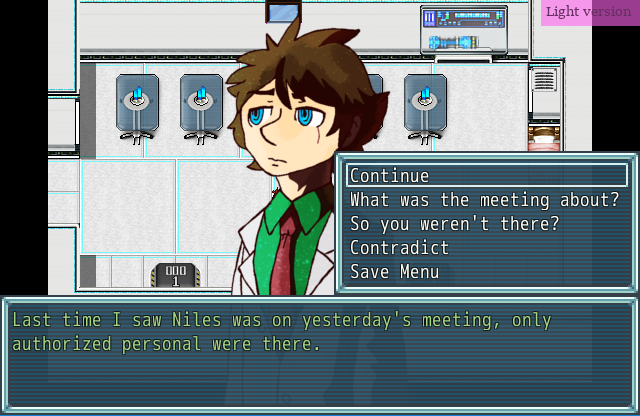 I found the art style a little off-putting, especially the map tiles and sprites, but that's a subjective matter. I liked the character illustrations a little better, and that's what you'll spend most of your time looking at, as the game is primarily a series of conversations. The story is intriguing and well thought-out. It not only keeps you guessing as to the murder mystery, it brings up questions about artificial intelligence and how it should be handled. The grammar has some obvious problems, but for the most part it's readily intelligible to a native English speaker, and I'd guess it's better than most English-speakers would do in trying to write a game in some other language. For improvements in a future version, I would recommend some way of reviewing notes about important information that has been given, as details like when certain things occurred are crucial and not easy to remember from previous conversation. I also think some less intense music would be good for most of the interrogation sequences. Despite issues, Event Horizon Murder Case is good enough to get my up-vote.